Nothing is as discouraging as finishing a painting project, only to have paint blisters or bubbles appear in the new finish. This type of problem can occur in any type of paint, but latex and acrylic formulas are more susceptible. Bubbling and blistering occur indoors and out, often with no apparent cause. Proper preparation is the single most important thing you can do to avoid bubbles. What Causes Paint Blisters and Bubbles? Although the end result is the same, blisters and bubbles are actually caused by two different things. Blistering occurs when the upper layer of paint loses adhesion and separates from older layers. Typically, this happens after the paint has dried completely, and there are no good guidelines for determining if or when it will occur. The problem can crop up within a day, or not until a year later. The most common cause of blistering is applying paint to a damp or wet surface. Allow the substrate to dry completely before priming and painting. If there is a continual moisture problem (in a leaky basement, for example), it must be corrected before painting. It’s also important to let the paint dry before exposing it to wet conditions. The weather channel is your friend! Avoid painting within four hours of a rainstorm; high humidity often causes blisters (sometimes water-filled) to form. If the surface drys out quickly, sometimes these will disappear. If a bubble remains after the surface dries, however, you’ll need to scrape it off and repaint. In other cases, blistering is caused by applying paint to a dirty or incompatibly finished surface. As the paint dries, it shrinks slightly, pulling up poorly adhered sections of old paint. It’s important to thoroughly clean walls (both interior and exterior) before painting. Never apply oil-based paint over a latex base. It is possible to use latex paint over oil based primers and paints, but it’s better to stick with one type of formula. If your siding has been treated with linseed oil in the past, prime and paint with oil-based products. Bubbles form as the result of a chemical reaction. This problem is far more common when paint is applied to a hot surface. Essentially, the top layer of paint dries, forming a barrier that prevents the solvents from escaping easily. At the same time, the hot surface causes the solvents to vaporize. These expanding gases put enough pressure on the paint to force it away from the substrate, creating a bubble. This occurs early on, during the initial drying phase. Avoid painting in hot weather (above 85°F) or in direct sunlight. If these conditions can’t be avoided, use a paint conditioner to slow drying. Flotrol is formulated for water-based paints, and Penitrol is a good option for oil-based ones. Avoid using mineral spirits or water for this purpose; excessively thinned paint only compounds the problem. As with any paint problem, the best defense is proper preparation. If you’re already faced with a paint blistering or bubbling problem, it can be corrected by removing the damaged paint, smoothing the surface and repainting. Just make sure to correct the underlying cause of the problem, or it will recur. I have a large wood deck, which I have had to paint every year since it was built in 2006. I use latex solid deck stain. Bubbles appear within 24hrs. I do not paint in sunlight, deck appears to be dry, very frustrating and big expense, presently I’m peeling off the paint to redo but wonder what I should do before I repaint if I could afford to I would replace the deck with a composite. I’m getting to be too old for this annual nightmare. Unfortunately their must have been something applied from the beginning that is causing it to not stick properly. The very bottom coat is what determines how anything else on top will stick or react. You need to use a deck stain/paint remover/stripper and pressure washer to try to remove any and all product ever put on the deck so you can start over fresh. And personally I hate solid deck stain. It goes on like paint, actually leaves a coating like paint, it peels like paint. What is that saying if it walks like a duck and quacks like a duck, it’s a duck. Inquire about a different product. Maybe a semi transparent? IDK for sure. Deck products are not my specialty. good luck. Our bathroom was painted 3 months ago and a small area of paint blistered this afternoon. It is in a small half curve shape. I cannot think what would have made it happen. Any ideas? It’s impossible to say for certain what caused the blistering but one way to find out is to carefully remove the blisters and see if they go through to the old paint or even further. If they stop at the old paint then water got under the paint or there was some surface contamination. If they go further down then the problem could be more troublesome. I just re furnish my utility trailer floor with new pressure treated boards and just finished painting it with Trmeglad paint on a sunny day and when it got almost dry it started blistering. How can I fix this and is this caused by the sun or that the pressure treated wood might not be completely dry? You will have to sand out the blisters and reapply the paint. Most likely this was caused by moister still in the wood. I just had my natural wood siding refinished on my house with Structures finish, and it is blistering very badly. Will ask the contractor to repair it, but have very negative feelings about the end result.Very disappointing. We just finished painting our garage, cedar siding lap, we scraped, sanded, filled bad spots with interior /exterior filler, sanded and feathered all edges, wiped clean with solvent, let dry and primed spots that needed it, let dry over night and painted the next afternoon, now 5 days later noticed blistering on one end of garage, What is the problem and why? I just finished a paint on a cedar siding house. I live in Calif. , Humboldt county. The beach is less than a mile away. So it is usually damp from fog, and when the sun does come out it is very humid. One day after I was finished 3 blisters popped out. Anyone have a suggestion? Scrape or sand the blisters to remove, spot prime (prefer oil base but use whatever you have), then touch-up the spots. I repainted my whole house and attached garage with Sherwin Williams acrylic paint. Previously I had painted it with latex paint. My garage is an add on to the original house so the underling paint may not be the same as the rest of the house. Leftover paint in the garage was “Varathane Colors in Plastic” and seemed to match the garage. The house came out great. The garage wall with sun exposure had large bubbles. The took off all of the paint layers down to the primer over the cedar siding. Cutting out the blisters priming and repainting solves the problems in those areas, but then new bubbles pop up nearby. After four tries sometimes with and without repriming the result is the same. The repainted areas are fine, but new blister pop up, but never on a repainted spot. Ideas? In remodeling our 2nd bathroom, I have bubbling in a 4″x5″ area & 1 another very small area on a different wall. We removed old wallpaper, then scraped the old adhesive off, sanded & rinsed everything. Due to some imperfections in the walls, I needed 3 coats. The bubbling didn’t start until the 3rd coat was applied. After almost an hour of drying, I can still peel paint from the middle of the wall with my finger nail. Any ideas? First, allow the paint to dry overnight before any scrapping. An hour is enough time to dry to the touch but not do any decent curing. The bubbles will need removing, scrapping, then prime with either an oil base stain sealing primer or shellac primer. Now any spackling can be done before painting. In the future always prime areas that received any repairs or if wallpaper is removed. This will properly seal these areas and reduce future problems. My kitchen was painted 2 years ago, I noticed a small area had some bubbling it now seems to be spreading. What should I do to cure this problem? Yes at times even though prepped and primed some customers have constant problems with drainage with their gutters. 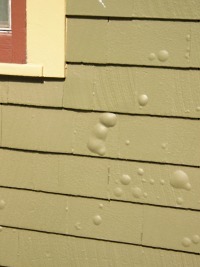 So coating or painting can bubble and blister on gutters if there is always standing water inside the gutter. Also in cold weather the water can freeze, turn to ice and expand the gutter which is also hard on the coating clinging to it. Constant moisture in gutters can make it more of a problem than it has to be. Moisture may perm through and get behind the film. Keep gutters draining properly is the answer aside from good prep and priming pre-painted or raw gutters. Yes I would like to ask a few questions about some finishing on 86 new shutters we built. At the same time we built a lot of other shutters also, no problem. W e are a shutter manufacture. I have never had a problem like this. We used a kil dried wr cedar. We pre-primed all the parts with a Sherwin Williams fast drying primer, Hybrid blocks stains. The shutters were then built and primed again. The shutters were shipped to customer and they painted them and hung them. I know get a ton of pictures of their shutters blistering and peeling in a months time. What can be the problem? This sounds like a primer problem. You don’t mention what paint was applied but lets assume it was something good. One possible cause is the primer dries too hard, not allowing good adhesion of the paint. This can happen, mostly when a primed item sits unpainted for weeks or months. Another possibility is the applied paint isn’t very good, low quality. Combine that with a hard primer and this could be the culprit. Make sure to contact your Sherwin Williams sales rep and let them know what is happening. We have used a 5th grade redwood PAR board for the fascia on some houses and are having a lot of blisters appearing, not always over the knots in the wood either. The timber is kiln dried and un-treated. We have tried 2 systems – 1st, using knotting solution and then Johnstones stormshield flexible satin in Anthacite and then as an alternative an aluminium primer and then Sadolin super dec in Anthracite. Both times the timber has been kiln dried and stored in dry conditions, primed, fitted and then painted and we are getting issues all over the place with blisters. When you peel them it looks like the paint just has not keyed but then in other area’s it has bonded extremely well and is impossible to remove. Any idea’s would be greatly appreciated. I don’t think this is a timber issue but a primer issue. A standard oil base wood primer would be best, with all sides primed (back primed), and it would do a good job sealing knots and tannins (might need 2 coats). Johnstones Stormshield can be applied over the wood primer for best results. The Sadolin product is a solid stain and self-priming. I would try changing the primer. Plus you should contact your paint sales rep and let them know what is happening as they are local and might have some good ideas.